Sphyracephala brevicornis, photographed by Karl Hillig. The Diopsidae, stalk-eyed flies, are a distinctive family of flies in which the head is usually extended laterally, with the antennae positioned near the ends of the lateral processes close to the eyes (in other flies with similarly-shaped heads, the antennae remain close to the midline of the head). Characters (from van Bruggen 1961): Head with two pairs of bristles (inner and outer orbital bristles) and no vibrissae. Head usually produced laterally (except in Centrioncus) to a varying degree in both sexes; eyes and antennae borne on these processes. Thorax showing modification of pleurotergite into dome-shaped swelling or well-developed spine; scutellum with two spines, supra-alar spines may also be present; posterior thoracic spiracle encircled by weak hairs, none of which are developed into a bristle. Fore femora frequently incrassate, bearing a double series of small teeth on ventral surface, bristles may be present between these teeth. Wing venation greatly reduced, C complete, R2+3, R4+5 and M1+2 reaching margin near apex of wing, M4+Cu1 and A1 not always present. [B61] Bruggen, A. C. van. 1961. Diptera (Brachycera): Diopsidae. 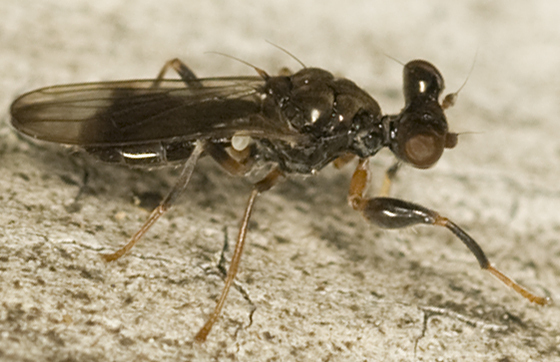 A partial revision of the Diopsidae or stalk-eyed flies of southern Africa. In: Hanström, B., P. Brinck & G. Rudebeck. South African Animal Life: Results of the Lund University Expedition in 1950–1951 vol. 8 pp. 415-439. Almqvist & Wiksell: Uppsala.